Despite the abundance of vegetables and fruit in shops and markets, fans continue to grow in their home gardens. But the problem is productivity, low in the middle zone of Russia for such care crops like tomatoes. However, gardeners have their own methods of increasing the number and quality of fruits of different cultures. Select the variety of tomatoesmost suitable for you not only in taste, but also by other parameters. For example, Northern regions of Siberia it is better to give preference to the early-ripening or mid-season varieties, for example, "cherry" or "Labrador". Late varieties will likely not have time to give a sufficient amount of fruit even in a greenhouse, as summer in the Northern and Eastern regions of the country are usually short. Improve the soil before planting. For this dig site and put the humus and ash. Put the tomatoes in the greenhouse. It can protect the plants on temperature gradients, which in most regions of Russia is possible in the middle of summer. Choose the right place to install it - the tomatoes should get as much solar heat and light for successful growth and fruit ripening. Growing tomatoes in the soil is also often possible, but is fraught with the risk of plant death from frost at the beginning or at the end of the summer season. This will significantly reduce the yield of your tomatoes. Regularly water and fertilize the bushes of tomatoes. However, some gardeners recommend to suspend feeding during the formation of ovaries, because excess of some substances may hamper the process. Subsequently, during the emergence and growth of fruit, return to the same schedule as fertilizer. As fertilizer use as natural mullein, bird droppings - and produced artificially, for example, compounds based on nitrate. 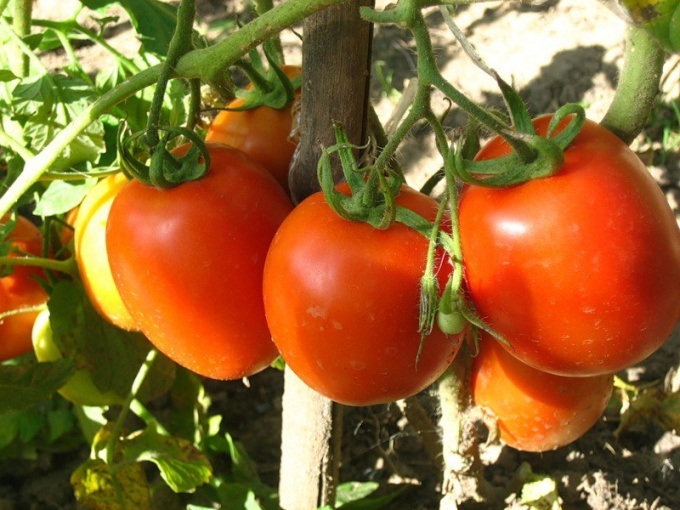 Treat bushes of tomatoes means against diseases and pests. Most plant development and the formation of ovaries harm aphid and late blight. In the first case it is enough to wash the casting with a soap solution with the appearance of the webs, indicating the presence of insects. In the second case, spray the damaged and nearby plants with Bordeaux liquid - it can help, even if tomatoes have become brown from the spread of the fungus. The diseased bushes will just have to weed.